EPRLF party leader Suresh Premachandran has said that President Maithripala Sirisena is the prime minister of the country for the second time, and he has created a stabilizing position in the country. He said this in a special presentation of a weekly Tamil magazine. 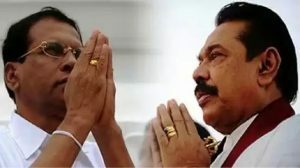 He also said that the crisis situation in the country for a period of no more than a month has not yet returned to the cynical state, while Mithri and Mahinda took the decision to create a stabilizing situation in the country and buy some of the other parties to prove the majority in parliament. They thought that they could fulfill their own actions. But today the country has been forced into a bad situation because it has not been able to prove a majority in parliament. The country is in a position to earn the hatred of the entire Sinhala people. Dollar's value has dwindled, the economy has deteriorated, and there have been several million losses. The above situation created with the aim of narrow political profits has affected the entire country. It is difficult to recover from the worst situation for more than a month. A president who has taken a sworn oath to the constitution and assert that it will protect the Constitution can not be accepted as a contradiction to the Constitution and in contradiction to the Constitution. So the President should take responsibility for all the events that have been taking place for the past one month. A worst environment has been created by the president, so as noting that the president has taken a legitimate decision to establish stability in the country and restore the political economic crisis.